Following the City of Lancaster, Calif.’s growing usage of solar energy — part of its plan to become one of the first “Net Zero Cities” in the world by achieving zero carbon emissions — the Antelope Valley Transit Authority (AVTA) recently took a huge step in making that goal a reality. In February, the agency awarded a contract to BYD to manufacture up to 85 electric buses over a five-year period in a quest to become the first all-electric bus fleet in the nation. Under the order from AVTA, BYD will build and deliver a mix of 40- and 60-foot low-floor buses as well as 45-foot commuter coaches, as funding permits, to replace its current fleet of diesel buses. 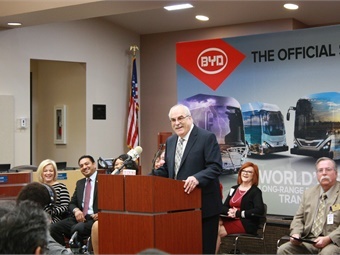 The initial-funded order will consist of 13 60-foot articulated buses and 16 commuters, which will be built at BYD’s Lancaster, Calif., plant that is mere minutes away from AVTA’s facility. 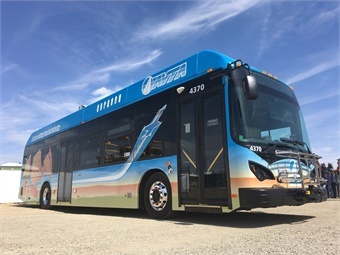 AVTA’s path toward going electric began with a $1.9 million grant from Los Angeles County Supervisor Michael D. Antonovich to purchase two electric buses from BYD that would use inductive charging, which is currently being installed by Salt Lake City’s WAVE Technologies Inc. Since receiving the first of those vehicles in the spring of 2014, AVTA has experienced positive results, including a 90% in-service rate and $1.20 cost-per-mile savings versus its older diesel buses. “If you multiply the per-mile savings by the 500,000 miles you can do over 12 years, that is a significant savings over the life of the bus,” says Engel. In February, AVTA’s Executive Director Len Engel announced the agency’s intent to become the first agency to boast a 100% electric bus fleet. Depending on the operator, Engel adds that the agency is recording an average range of 185 miles per charge since putting the vehicles in service, with their more experienced operators getting as much as 220 miles per charge. Aside from the overall cost per mile to run the electric vehicles, Engel adds that the agency has also experienced some unexpected benefits as well. “Our battery density has increased; we have gone from a 200-amp-hour battery to a 280-amp-hour battery in the last 18 months,” says Macy Neshati, BYD’s VP, Bus and Coach Sales. “What that means is it gives us an option to keep the same size battery banks on the bus and extend range, or we can take batteries off the bus and maintain range. Depending on the customer and the model, we have used both of those philosophies. On the articulated model, we wanted to get closer to, or over, 200 miles, the original configuration had 170 miles of range. So, using the denser energy batteries that we have now developed, we are able to go up to 200 miles and use the same amount of batteries — we didn’t have to increase weight or add batteries, but we were able to extend range. The initial order includes 29 electric buses — 13 60-foot articulated and 16 commuter coaches — that will be delivered over the next 12 months, as well as the equipment for 11 200-kilovolt-amp (kVA) inductive chargers and the secondary pads that will be installed on the buses. Funding for the $39.4 million project comes from a significant $24.4 million Transit and Intercity Rail Capital Program (TIRCP) grant from the California Department of Transportation, with the rest coming through Federal 5307 funding and local match. Engel says the AVTA’s plan to create a bus rapid transit route down one of its major corridors where there are often standees was a major factor in the agency’s ability to secure the TIRCP funding. As part of its initial two-bus purchase, AVTA also worked with the Salt Lake City-based company WAVE Technologies Inc. to install two inductive charging systems. Charging vehicles wirelessly reduces the required on-board battery size and weight, extends vehicle range and increases battery life by increasing the time the battery operates in a favorable charge level, Masquelier explains. “These attributes are attractive to vehicle operators and businesses by improving the already favorable maintenance and operating costs of electric fleets and extending range to meet operating demands, a factor that has hampered conversion to electric vehicles,” he says. “The WAVE system also alleviates safety concerns, improves aesthetics and reduces installation costs compared to alternative-conductive power systems, such as overhead catenary wire systems. 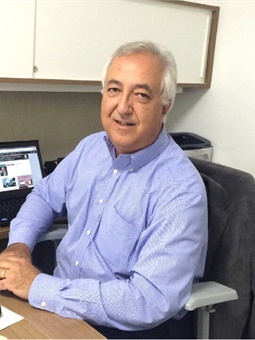 The WAVE system has been designed to be compatible with all OEM battery-electric buses." 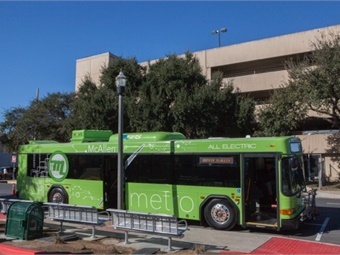 In addition to the AVTA’s two chargers, the WAVE system is in use at Calif.’s Monterey-Salinas Transit and Texas’ McAllen Metro. Future deployments set for this year include two more Calif. agencies — Long Beach Transit and the Central Contra Costa Transit Authority. Engel says that funding will be the biggest obstacle for the agency in trying to reach its aggressive 2018 goal, with the agency focusing more on California-based funding sources versus the oversubscribed federal programs, where there is currently only $55 million available nationwide through the FTA’s Low or No Emission Vehicle Deployment Program (Low-No). 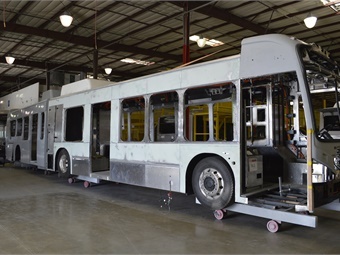 With the first 29 electric buses set to be delivered in the next year, BYD is constructing AVTA’s 16 commuters and 13 60-foot articulated buses at its plant in Lancaster, Calif.
Another challenge the AVTA faces, will be building the infrastructure to be able to charge up to 85 electric buses. The agency is currently in the final phases of design on the infrastructure necessary, with construction set to begin this summer at an estimated cost of $5 million. AVTA is also looking into the possibility of attaining a grant to acquire some additional property for solar panels and battery storage. “The facility will also include an I/O Controls software system that will control how each bus draws power from the grid so that we can keep the balance,” says Engel. Another hurdle for AVTA has been negotiating power and bringing enough power into its facility to actually charge the buses. The agency has negotiated with the city’s power utility to gain a favorable price on electricity and reached an agreement to avoid demand charges. The agency will also be able to allocate energy generated at its facility via solar panels to the inductive charging stations that will be onsite at a local city park. Engle says that getting out in front of setting up the charging infrastructure would be the biggest takeaway for an agency looking to take on a similar project. Engel adds that to combat the possible loss of power in the instance of a blackout, the agency will also invest in a $1 million generator. He also says that while challenging, he is excited at what’s ahead for the agency in reaching its goal.